Whether you believe the best comes from Kansas City, Memphis, the Carolinas, or Texas, if you love barbecue, Republic of Barbecue offers a richly satisfying journey into the world of barbecue as food and culture, filled with first-person stories from pit masters, barbecue joint owners, sausage makers, and wood suppliers. It's no overstatement to say that the state of Texas is a republic of barbecue. Whether it's brisket, sausage, ribs, or chicken, barbecue feeds friends while they catch up, soothes tensions at political events, fuels community festivals, sustains workers of all classes, celebrates brides and grooms, and even supports churches. Recognizing just how central barbecue is to Texas's cultural life, Elizabeth Engelhardt and a team of eleven graduate students from the University of Texas at Austin set out to discover and describe what barbecue has meant to Texans ever since they first smoked a beef brisket. Republic of Barbecue presents a fascinating, multifaceted portrait of the world of barbecue in Central Texas. The authors look at everything from legendary barbecue joints in places such as Taylor and Lockhart to feedlots, ultra-modern sausage factories, and sustainable forests growing hardwoods for barbecue pits. They talk to pit masters and proprietors, who share the secrets of barbecue in their own words. Like side dishes to the first-person stories, short essays by the authors explore a myriad of barbecue's themes—food history, manliness and meat, technology, nostalgia, civil rights, small-town Texas identity, barbecue's connection to music, favorite drinks such as Big Red, Dr. Pepper, Shiner Bock, and Lone Star beer—to mention only a few. An ode to Texas barbecue in films, a celebration of sports and barbecue, and a pie chart of the desserts that accompany brisket all find homes in the sidebars of the book, while photographic portraits of people and places bring readers face-to-face with the culture of barbecue. Thinking Locally, Barbecuing . . . Globally? Elizabeth S. D. Engelhardt, Associate Professor of American Studies at the University of Texas at Austin, writes and studies food, gender, race, and class in the southern United States. She and eleven of her graduate students set out to study the life and culture of barbecue in central Texas. They're a diverse group that includes native Texans, people from other barbecue strongholds of the U.S. South, a Chicagoan, and even a couple of northeasterners. They all share a passion for listening to stories, debating and trying to understand American cultures, and eating lots of barbecue. We all need to eat. Whatever our age, our skin color, our gender, our nationality, or our class, we have a relationship with food. Shouldn't food, then, be a window into who we are as humans? Into how we think of ourselves, organize our societies, celebrate, pass our daily lives, include some people and exclude others from our families? For a long time, the implicit answer has been no; perhaps food suffered from being so obvious, so common, that it seemed too mundane to spend time on. Clearly, the answer in the United States has changed to yes, in popular culture at least—we have television channels, sections of bookstores, magazines, movies, and songs dedicated to food. We describe our food lovingly or critically, linger over it, and tell each other where to find it. If we let it, food can do more: it can help us talk about how we negotiate race, class, gender, national character, and all the rest of those powerful aspects of ourselves and our societies. Who has food, who shares food, who prepares food for others, and who makes money off food—all are windows into who we are. But—and this is the best part—even while we're having those serious conversations, we can be playing with our food. We can be laughing, adventuring, partying, and indulging. Even food fights are usually fun. Some of the rowdiest food fights in the United States involve barbecue. Claims of territory, boundary drawing, and quasi-religious testifying break out over slow-cooked meats. Texas barbecue inspires official proclamations (from as august a body as our state legislature). Its earnest defenders pick fights with other barbecue. Its devotees (including us) have built involved mythologies around both barbecue in general and Texas barbecue in particular. Barbecue myths go something like this. Pigs are primary. Sauce recipes are secret and guarded to the grave. Barbecue is wonderfully common, unfussy, and even happily unsophisticated: it doesn't need a parsley-sprig garnish; you don't have to wear a dress or a tie. Neither can you rush barbecue; it's the ultimate slow food, and you won't ever find real barbecue at a fast-food stand. In fact, barbecue connects you to a simpler time before all that civilizing and rushing around of modern life took hold. You can't make barbecue in a suburban kitchen, and in fact, the best barbecue is the province of men. Barbecue isn't health conscious; it doesn't apologize for polluting the air with hickory smoke. If you find a barbecue parking lot where the pickup trucks are next to sports cars and motorcycles, and if that barbecue is off the beaten path, with no listing in the phone book or—heaven forbid—the Internet, and if the pit master is ancient, possibly wearing overalls, certainly speaking with an accent and without regard for the rules of grammar—well, then you've found real barbecue. Texas barbecue myths take pride in being rebels. Sure, the myths say, barbecue in Texas remains gloriously unreconstructed: uncivilized and unapologetic. Men barbecue, the process takes time and secret knowledge, and if you find that parking lot in Texas, you're a fool if you don't pull in. But, the myths say, true Texas barbecue is all about beef. It came from German and Czech settlers making sausage and then smoking beef brisket in their meat markets. They learned from cowboys how to get the brisket tender. According to the myths, the real thing in Texas comes on a piece of butcher paper, features brisket and sausage, and must be eaten without the nicety of a fork. Maybe you get a knife, but then again, maybe you just share it with the person next to you and leave it chained to the table where you found it. Sides are getting kind of fancy for true Texas barbecue, but maybe you can grab some crackers or white bread from the store and have them along with. Sauce is something amateurs in other states hide behind. If you need help finding your barbecue, you can just head to the barbecue capital (Lockhart) or the sausage capital (Elgin) of Texas—the legislature has officially designated them for you. We couldn't resist the challenge. Were the myths true? What wasn't being told? What does barbecue tell us about who we are—as Texans, as Americans, as men and women, and, in the words of May Archie, a barbecuer from Huntsville, Texas, "white, black, blue, and green"? The twelve of us got in our cars. We headed out to crisscross our part of Texas. We set out to see what we could find—and this book is the result of our adventures. It turns out that we barbecue in lots of ways here (with sauce and without, over different kinds of wood, at different temperatures). We certainly barbecue beef brisket and serve beef sausages, but we also smoke and grind a lot of other things—ribs, pork, venison, turkey, goat, chicken, and mutton. While those cowboys, Anglo and Latino, bequeathed some ingredients and cooking practices, and while those German (and Czech, Alsatian, and even southern white Appalachian) meat markets loom large, African Americans did a lot of the work and should be celebrated by Texas barbecue. Barbecue restaurants in Texas today seat new money at a table with oil money, no money, and old southern money, and all roll up their sleeves and dive into the meal. But then and now, we found that American racial politics—from segregation to gentrification—means not every table has always been open to every person. From Llano to Lockhart, Austin to San Antonio, Taylor to Gonzales, and Huntsville to Marble Falls, Texas barbecue feeds friends catching up with each other; soothes tensions at political events; fuels long-running and upstart community festivals; sustains workers in suits, dresses, and hardhats; celebrates brides and grooms; and even supports churches. Some Texans guard their recipes through generations; others bottle, package, and sell their products through the mail, across the Internet, and in grocery stores around the world. Swaggering men, tough and sweet women, rebellious musicians, Jewish, African American, Asian American, Tejano, Hispanic, conservative, and liberal families, and everyone in between sit down together over brisket and sausages. Even a few vegetarians and environmentalists join the party. The party in this particular book is like a big community potluck—both in the makeup of the team behind it and in its overall organization. In December 2006, my phone at the University of Texas rang. Luke Zimmermann, the president of the Central Texas Barbecue Association, was looking for someone to help collect, document, and preserve the stories of barbecue culture around Central Texas. While Luke and I had not met before that day, we both knew John T. Edge over at the Southern Foodways Alliance at the University of Mississippi—another organization dedicated to collecting and celebrating the traditions, history, and culture of food in the South. Together with the eleven other authors you see here—who began as students in my graduate class on American foodways and who have since become so much more—the Central Texas Barbecue Association and Southern Foodways helped create this book. We made wish lists of interview subjects by having literal potlucks. We filled our plates, sat down, opened up some bottles of Lone Star, and talked into the night. Staff members of Southern Foodways flew to Austin, local barbecue practitioners and devotees came along, and we all started to imagine how we might take a picture of the life and times of Central Texas barbecue culture. When we committed to surrounding the stories of the people we interviewed with photographs, essays, and the flights of fancy we call sidebars, we again took the potluck as our model. You can find more about the twelve of us sitting around the potluck's writing table at the end of the book, where we talk about our personal barbecue histories. Unlike typical anthologies, for which individual pieces are created in isolation and authors do not know one another, every page here was debated, improved, and chosen by the whole team. Finally, the potluck remains the guiding metaphor for our goals for the book. The best potlucks put as many dishes on a table as possible—they fill every square inch. At their best, they create a whole that's greater than the efforts of individual cooks. But almost necessarily, when you invite so many to the table, not every dish perfectly matches every other dish. On the one hand, that lets you fill your plate in your own way as you try surprising new combinations and help yourself to old favorites. On the other hand, it can mean that flavors—in this case, opinions, versions of history, and definitions of tradition and authenticity—can clash. We point out some of the contradictions or differences of opinion between people and ideas; others we leave for you to puzzle over. Barbecue is large and diverse even at this relatively small potluck. Over the course of the book, we try to sort out historical developments in barbecue. We lay out the social and cultural contexts from which competing stories of barbecue emerge. Yet at the end of the day, we believe our interviewees are the experts in their lives and experiences, and we are the listeners and learners. So we invite you to join us in being willing to fill your plate and just enjoy it when the pickles touch the banana pudding and the brisket gets buried on the bottom, so that you end up eating it last. Fitting, really. Many books about barbecue are either cookbooks (often filled with approximations of secret recipes) or restaurant guides. This book is neither. That's because a written recipe cannot re-create the feeling of sitting at the counter of the Taylor Cafe and hearing Vencil Mares talk about when the restaurant had two doors, two jukeboxes, and people from three cultures (African, Hispanic, and Anglo Americans) eating his food. A list of restaurants does not make space for Ben Wash to talk about the Juneteenth celebrations of his childhood, when people celebrated victory over slavery by crafting a festival that outshines any long day we may have had going from restaurant to restaurant on the barbecue trail. Finally, recipes and reviews hide the secret life going on behind the scenes—the support systems that make restaurants and recipes possible. Listening to Ronnie Vinikoff calculate the amount of sustainably harvested wood consumed by Austin restaurants, or to Marvin Dziuk recall the days when every town had a slaughterhouse for neighborhood homes and restaurants, shows how barbecue is entwined in larger cultural issues. In other words, this book differs because at heart its potluck extends to include people who have lived their lives not just making, but making possible, barbecue in Central Texas. Other books about barbecue set out on a quest to judge what counts as real or true barbecue. At their extreme, these books look for the perfect barbecue, according to their predetermined standards. Usually they fail to find it; or they find it, but it's going to close next week; or they find themselves rather than finding the barbecue. Taking on a little bit of Texas rebelliousness for its own sake, we traveled a different path. Here, you won't find an absolute standard for what Texas barbecue is. Partly, this comes from our appreciation of the complexities of Texas cultures. We decided to observe the broadest range that we could—if some folks call it barbecue, and at least a few people agree, then we wanted to talk to them. We found all types when we headed out in our cars, and so rather than ranking or editing them, we are giving you the full potluck table (even making space for a family relative, barbacoa). We found it in lots of places too—from successful chain barbecue restaurants to barbecue haute cuisine to those tiny owner-operated businesses with primitive picnic tables. We talked to people who use mass-produced rotisserie pits and propane burners, as well as those who use grandfathered-in fifty-year-old brick pits and woodpiles. We heard from people who say it isn't barbecue if it isn't cooked for at least twelve hours, and others who say their barbecuing is done in three. We found a plethora of meats, a diversity of flavorings, a mix of approaches to new technology, and a spectrum of opinions. To invite as many people as possible to our potluck, we deliberately used a broad definition of Central Texas. It's impossible to take out a map and draw a definitive line around Central Texas. The edges are blurry; with geological faults and limestone and piney woods so close together, geography doesn't help either. History provides no answers, since this area has been the western United States frontier, the north of Mexico, the easternmost part of the West, and a member in full standing of the South. We are not interested in arguing that there is a unified and unchanging culture called Central Texan—because that might mean leaving out some of the voices we heard when we got out of our cars. So instead, we just started where we were, in and around Austin, and we drove about two hours in any direction where people agreed to talk to us. We followed the smoke plumes rising over small towns, and we hit the hot spots people were already celebrating. We make no claim of being comprehensive; we were deliberately quirky in our approach, letting our adventure take us where it would. We hope you'll grab a map so that you can see the places we stopped. But we also hope others will follow behind us and fill in more places on that map. We would love to see similar teams fan out across the rest of Texas to help us connect what we found here to nearby and far away. Along with Southern Foodways, we support all projects that document and preserve the people and practices of all southern barbecue cultures. So perhaps we are more persuaded by viewing Central Texas as a vibrant crossroads—with many different peoples, practices, and stories. We asked, without preconceived notions, what's barbecued here? Who's barbecuing now, and who barbecued in the past? How do they do it? Why does it change? Because studying food, and barbecue in particular, is so new, as a society we have rarely asked people where they learned to barbecue, how their grandparents smoked meats, what has changed over their lifetime, what precisely their method of cooking is, and why they find some changes necessary and others damaging. We have overlooked them as holders of family, community, and national knowledge. We tried to change those oversights in our recorded interviews. Every interview we conducted is available as a full-length downloadable file from the Southern Foodways Web site, www.southernbbqtrail.com. You can also listen to clips of each person so that you have voices to go with their faces. (The audio clips are also the places to go to learn how we say things here—if you're unsure, for example, that Kreuz, Dziuk's, Mueller, and Llano are, roughly, krites, jukes, miller, and land-o without the d.) Treasures hide in the full transcripts: you can hear Jim McMurtry recall a random telephone operator who loved Smokey D's hot links; Joe Sullivan almost revealing the secret of his beans; and Pat Mares talk about the sisterhood of female pit masters. For more serious researchers, our primary materials are archived at the University of Mississippi in Oxford. The interviews truly were conversations: they went back and forth; they had interruptions; and they meandered as interviewee and interviewer got to know each other. For this book, we decided to take ourselves out of the interviews by turning them into first-person narratives, thereby allowing each person to tell his or her own story. If you are a reader who would like a more technical discussion of the recorded interviews and the excerpts included here, the end of book includes a sidebar just for you, entitled "Methodology Appendix: Fancy Words for How We Did What We Did." Just as a potluck has separate tables for desserts, main dishes, and salads, this book is divided into sections that focus on the food; the idea of place; history; barbecue ways of life; cities, cultures, and cuisines; and modern, changing barbecue. Within those sections, pit masters, proprietors, sausage makers, and wood suppliers share their stories and secrets of lives in barbecue. Photographic portraits of the people and places further bring readers face-to-face with the culture of barbecue. Surrounding the first-person stories are our short historical, reflective, or popular-culture essays on barbecue's themes—food history, cotton and cattle culture, race and gentrification, masculinity and femininity, our personal relations to barbecue, the phenomenon of the barbecue chain, music's connection to barbecue, technology, and sustainability, among others. Finally, we could not resist including some creative extras—a pie chart of desserts, a celebration of barbecue in movies, a list of all the forms of transport you can choose to get to your barbecue. These sidebars fit around the edges and highlight the spirit of barbecue in Texas. We invite you to make your own lists or to have some good-natured fun with our barbecue culture. Our friend John T. Edge has. He opens the book with an essay about why he thinks barbecue matters and how Central Texas fits into the rest of the barbecue nation. Some of the longest conversations we had while sitting around our potluck tables involved the final organization of the book. Should Remy's essay about changes on her grandparents' ranch go next to Joe Capello's thoughts about the evolution he's seen in Luling? Or should her discussion of Anglo-Latino racial politics be near Andrew and Ben Wash's attempts to sort out Austin's black-white integration struggles? Is it more important to start off with a section on food or one on history—and are they really separate categories? We needed several rounds of Big Red to fuel the marathon sessions. Ultimately, we chose a structure that begins with the plate and circles outward in time and space, ending with the technological future of barbecue in Central Texas. Because the interview excerpts come from wide-ranging, personally revealing talks that were conducted before the sections took shape, arguments can be (and were!) made for putting them in multiple sections. Ultimately, we hope you will do the same as you read the book. The first interview excerpt is from one of Austin's oldest barbecue joints; the final one is from one of our youngest interviewees; we have tried to make space for as many as possible in between. You can read this book in any order you choose; we hope you will imagine people in conversation with each other across the sections; and we hope you will make connections and conclusions beyond the structural ones we have made. None of our essays are long enough to be definitive—nor would we want them to be, nor do we really think it is even possible. All of the people featured have more stories to tell; there are many people whose stories still need to be heard. For every song or movie we listed in a sidebar, three were not included. This is, after all, a fast-changing and developing world. Barbecue restaurants open up and close down every day. Where to get barbecue, how it tastes, how it is sold, which practices are celebrated, and which are regulated away change all the time. We hope we included some things you have never thought about—or that seemed too natural to talk about. We hope you will disagree with us. We hope you will find evidence from wherever you are to add into the mix. We hope you will find issues that we didn't raise lurking here in the pages. We are acolytes to the masters who have spent their lives over pits, but we and you can be experts at close reading: taking the stories as inherently valuable and looking to see what's going on in them. We can also all start to tease out the meanings of food—we can talk, laugh, and fight about what else is happening here and in the rest of Texas, the rest of the United States, and the world. From the stories gathered here, you will find Central Texas barbecue an ever-evolving tradition practiced and nurtured by diverse Texans. 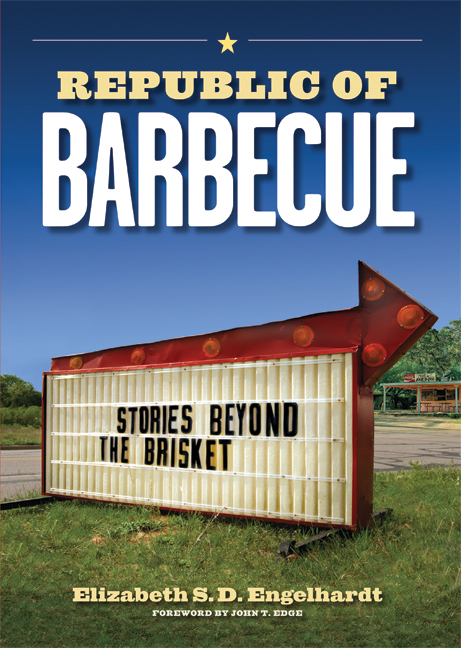 Whether you have never been to Central Texas or have been following the barbecue trail here for years, this book will take you on a new journey in the rebellious, proud, and dynamic republic of barbecue. Texas Monthly On . . .